I have to admit, despite not having any real starpower behind it. 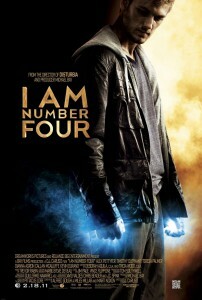 The marketing campaign behind I Am Number Four is working on me. The actors I do know, Dianna Agron, Timothy Olyphant, and Teresa Palmer have impressed me with sections of their previous work. Alex Pettyfer might look like he belongs on The OC, but I have a feeling that is the type of actor they are looking for in the role. Needless to say, I dig stories about superpowers, and if it can get beyond generic superpower cliches, but not get to wrapped up in its own mythology (ala Push), then we might have a small hit on our hands. An extraordinary young man, John Smith, is a fugitive on the run from ruthless enemies sent to destroy him. Changing his identity, moving from town to town with his guardian Henri, John is always the new kid with no ties to his past. In the small Ohio town he now calls home, John encounters unexpected, life-changing events — his first love, powerful new abilities and a connection to the others who share his incredible destiny.